The Pärnu River basin in Estonia covers an area 20% the size of Estonia. The river is 144 km long but with its tributaries (270 rivers and streams) it makes up a 3300km river basin. This river is the biggest historical salmon river in the country with a potential twice as big as the other rivers altogether to improve salmon populations. However, a big obstacle stood in the way of migrating salmon—the Sindi Dam. This 151 m wide and 4,5m high dam was built in 1975 to help provide water for the local (now extinct) wool industry. It is the first migration barrier within the river (14 km from the sea) so removing it will effectively open up the river basin. The idea to remove the dam first came about because the dam blocked the historic migration routes for salmon. But the removal will bring ecological benefit throughout the river basin including free passage for 34 different species of fish. Moreover, the dam was also in violation of an Estonian state policy that aims to protect and conserve natural habitats. To remove the dam, the government bought the land and dam itself for 1,3 million euros. The plans initially started in 2015 and took 1,5 years to complete the vision of the river for the local community before work could officially begin on the project. The actual construction started to take place in August 2018 as workers had to construct roads to the dam through the bush and underwoods that surrounded the dam. The complete removal is expected to take three to four months to finish. Then once the banks stabilize they can continue with the rest of the project including the new recreational activities for the local community and removing 9-10 more dams along the river basin. The total budget for the project is 15 million euros. 85% of funds came primarily from the EU’s cohesion funds and the rest was state funded as Estonia has regulations in place requiring protection of natural resources and habitats which includes many rivers. This budget allows the project team to not only remove this dam but 9-10 other barriers as well. 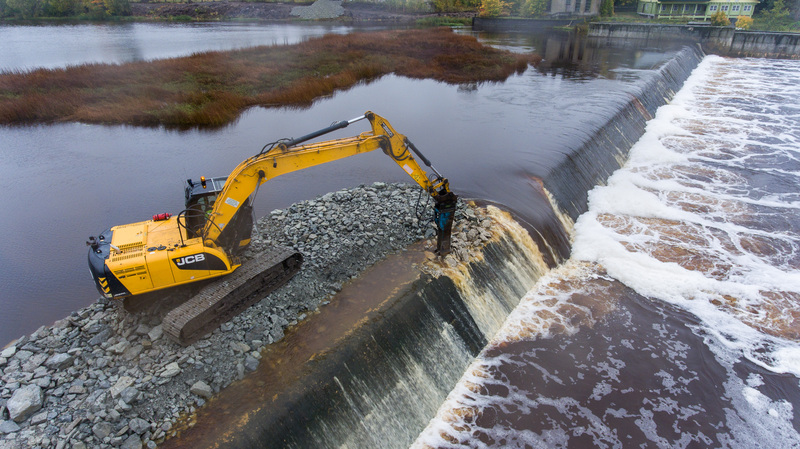 Once the project is complete, this will effectively open up the 3300 km of river basin in Estonia. The river is monitored every two years and we will update this case study once results of the removal are given.